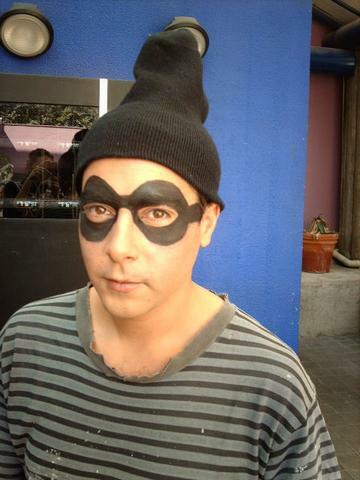 "DONA RISA" CON JAIME AYMERICH: DESCRIPTION DE LAS FOTOS NUEVAS : EL RATERO Y LA POLICIA. DESCRIZIONE DELLE FOTO NUOVE: IL LADRO E LA POLIZIA. ESTAS DE "DONA RISA" ,LO SHOW DE AMADISSIMO Y QUERIDISSIMO JAIME DEL MIO AMATISSIMO E CARISSIMO JAIME , EL ESTUPENDO Y VALIOSISSIMO ACTOR JOVEN MEXICANO JAIME AYMERICH, SON LA FOTOS NUEVAS LINDISSIMAS QUE HE PONIDO AYER , HOY INICIERO' A DESCRIBERLAS!!!! AQUI JAIME ES EL RATERO!!!! CON LA POLICIA QUE ES LA LINDA JOVEN Y VALIOSA ACTRIZ CARMEN MARTI!!!!!!!! LA HEMOS VEA CON BRAD PITT EN EL FILM TROYA, SON TRES FOTO DE ESCENA LINDISSIMAS , EN UNA VEAMOS JAIME QUE ES CON LA PERSONA ENCARGADA DE SU VESTUARIO , ES DE PERFIL Y ES LINDISSIMO JOVEN UN CHICO!!!!! EN LA SEGUNDA MARAVILLOSA ES UN PREMERO PLANO, ES ESPLENDIDO TIENE LA ESPRESSION ALEGRAS Y SUS OJOS LINDISSIMOS Y NIGROS, OJOS QUE REFLECTON SU MEXICO MARAVILLOSO SON MUY LUCENTES Y ALEGROS ANTES LA PEQUENA MASCARA !!!!!!!!!!!! Y LA TERZERA ES ESPLENDIDA, SI UNO NO SABIA QUE JAIME Y CARMEN SON JUNTOS POR TRABAJO VEA DOS AMIGOS JOVEN DOS CHICOS QU SE HACHEN FOTOGRAFAR JAIME TIENE LA ESPRESSION MUY ALEGRA Y CARMEN MUY DULCE !!!!!!!!!!!!!!!!!!! SON FOTOS NUEVAS ESPENDIDAS ESTAS DE "DONA RISA" LO SHOW DE JAIME AYMERICH!!!!! VE RECUERDO SIEMPRE QUE "DONA RISA" ES EN DOS EMPORTANTISSIMAS CIUDADES DE LA CALIFORNIA LOS ANGELES SUL CANAL 22 A LA 6 DE LA TARDE ORA LOCAL, Y SAN DIEGO SUL CANAL 43 A LA 6 DE TARDE ORA LOCAL DAL LUNES AL VIERNES TODAS LAS SEMANAS!!!!!!!!! IR A VERLA Y A REIR , JAIME VE ESPERA CON SU ALEGRIA!!!!!!!!!!! SOY DONY QUE ESCRIBE EL FANS CLUB OFFICIAL D'ITALIA ,IL FANS CLUB OFFICIALE D'ITALIA DE UN SER HUMANO MARAVILLOSO, QUE TIENE UNA BONDAD Y UNA TERNURA Y UNA DULZURA INCREIBLE ESPLENDIDA Y UN GRAN ECCEZIONAL ACTOR!!!! TI VOGLIO TANTO TANTO BENE MI JAIMITO MI CORAZON, MI ALMA , MI VIDA TU AMISTAD ES MARAVILLOSA PRECIOSISSIMA LA NECESITO SIEMPRE DE MAS , COMO SE NECESITA EL DULCE RAJO DEL SOL POR VIVIR!!!! !